Several people have questioned how I paint my nails without getting polish all over my cuticles. The answer is that I don't! My hands are definitely not steady enough to do the manicures you see on my blog without being a little messy at first. 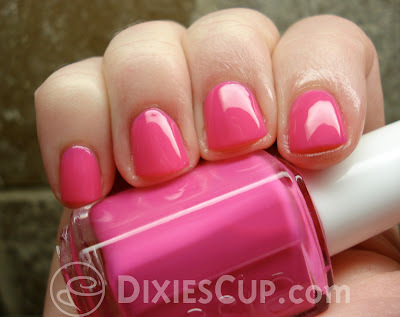 The purpose of this post is to hopefully answer some of your questions and help you do your own beautiful manicure. A fair warning: this post is kind of pic heavy. I find that I am a visual learner, so I think lots of pictures might help things make sense for you too. One of the most important things you'll need to clean up your manicure is 100% pure acetone. 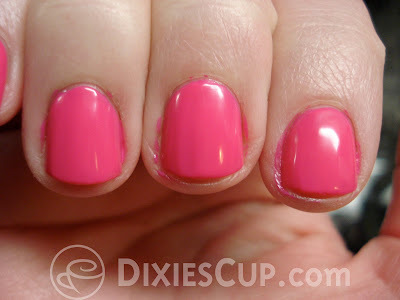 Other polish removers do not work near as well for this particular method. 100% acetone is very drying and can cause some serious damage to multiple types of counter tops and surfaces, so be careful where you use it. Don't pour it into a plastic container because it WILL eat through most plastics. I have poured small amounts into the bottle cap before, but Sally's also has those small little glass dappen dishes for under $1.00. In addition to the 100% acetone, you will need a good clean up brush. The brushes in the picture above are from the craft section at Walmart, but you can find a variety of brushes just about anywhere. I recently bought a package of nail art brushes at Sally's (after this picture was taken) and I think I might have found a new clean up brush. All you really need though is a fairly thin brush with stiff, short bristles. I primarily use the top brush. 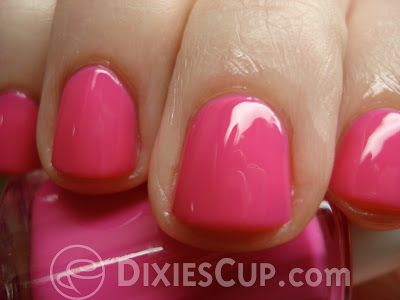 The photo above is typically how most of my manicures look before clean up. I apologize for the fact that these pictures have a different color of nail polish. I needed assistance in taking some of these photos and had to take them on a different day. Does anyone else wish that they had a 3rd or 4th hand sometimes? ANYWAY... I typically paint all five nails on one hand with my first coat of polish and then clean up. I then proceed to the other hand. By the time I'm finished cleaning up my other hand, the first hand is ready for its second coat of polish and its second round of cleanup. You can always choose to do a complete manicure and clean everything up at the end, but I've noticed that polish seems to come off a lot easier if you do your clean up while the polish isn't completely dry. 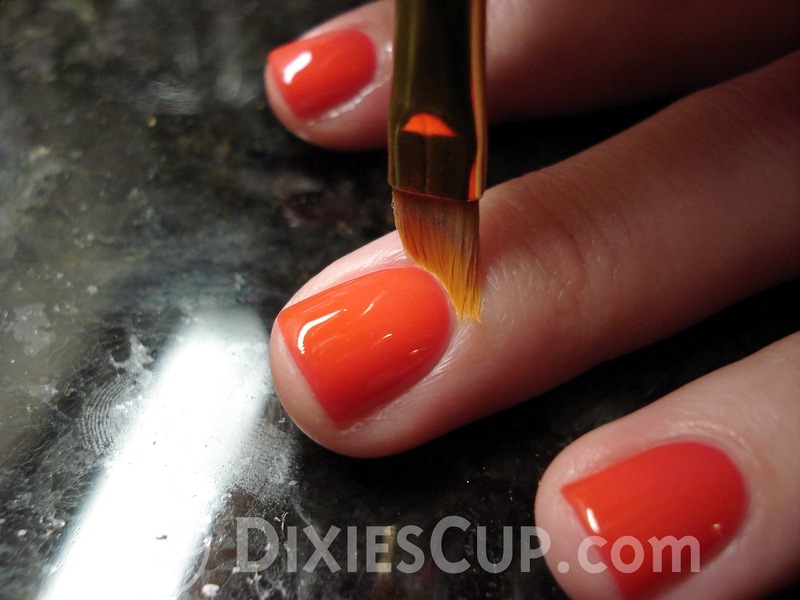 To clean up, you'll need to dip your brush in the acetone and wipe off the excess on the side of the container. 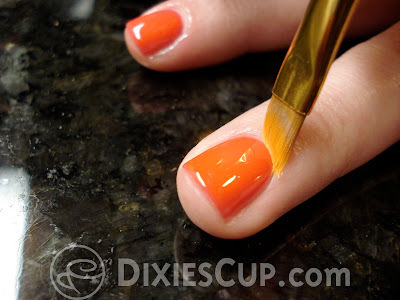 Try to stay as close to your cuticle as possible while you sweep the brush around your nail. Depending on how dark your polish is, you may have to do this a couple of times, but with 100% acetone it should come off pretty easily. You may also want to have a napkin or paper towel around to wipe the brush on after you've gotten some polish on it. I always work on top of a paper towel, so I just wipe my brush on that. Another thing that contributes to a nice looking manicure are healthy cuticles. 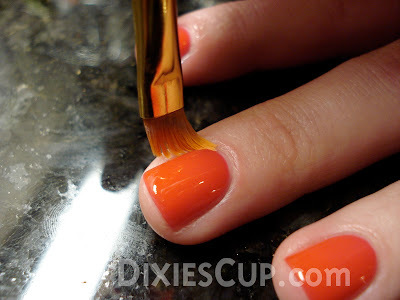 Really dry cuticles tend to crack, peel and bleed and they just don't look pretty. They also don't feel very good. If you keep your cuticles pushed back and you use lotion or a cuticle oil of some sort regularly, you shouldn't have these issues as much. 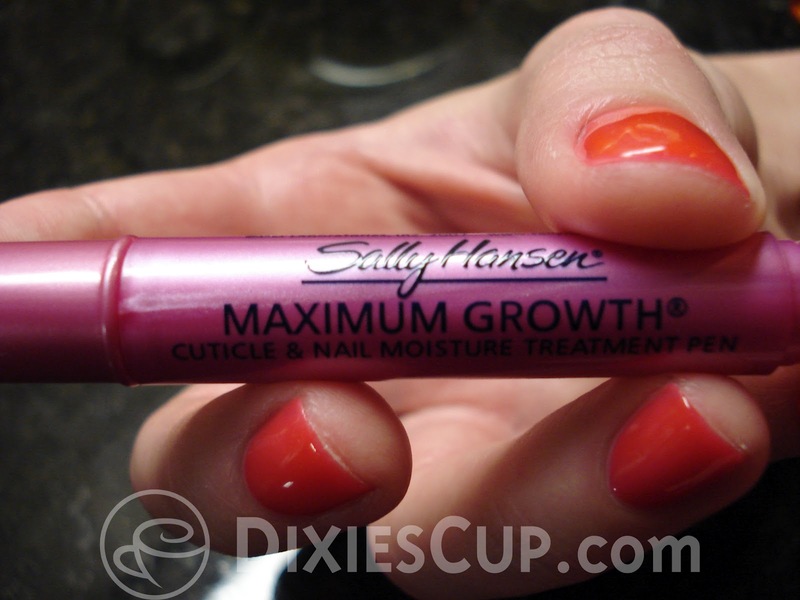 There are so many products out there that help out with cuticle care, you just have to look! 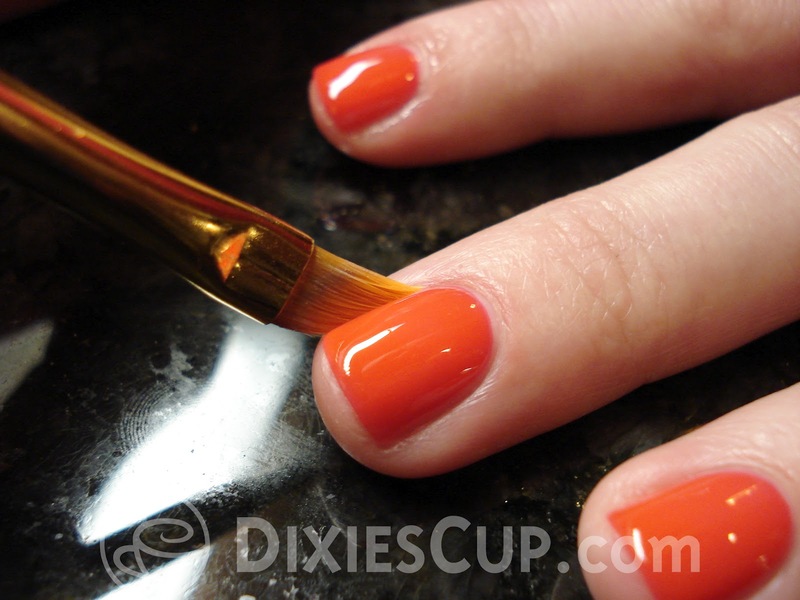 This particular oil is super easy to apply because it has a brush applicator. I use it as often as I can. My job requires me to wash my hands A LOT, so my hands tend to get very dry. I just keep lotion nearby and moisturize as often as I can. Well, that's all for now. I hope you all learned something today! Well, as far as I know you are one of the lucky few. I HAVE heard a couple of people that don't have issues being messy when they paint their nails, but most everyone I talk to doesn't have a steady hand and they tend to get at least a little polish on their cuticles. The acetone is quite drying, but I ALWAYS use cuticle oil afterwards and I've never had any major issues with dry cuticles.